I was pretty excited when I heard about the rumors that Apple Tablets have been accessing the web but according to this article over at Wired.com, the 'iTablets' detected could very well just be iPhones. (Boo! lol) Read on for more. A mobile analytics company has come forward with what it touts as evidence that Apple tablet prototypes are being tested — without offering any solid details suggesting the mystery devices are tablets at all. Analytics firm Flurry has tracked down 50 devices that it believes are Apple’s expected tablet. The devices’ IPs and GPS data give away they have not left Apple’s Cupertino campus, according to Flurry, which raises the firm’s suspicion that these are prototypes in testing. Flurry goes on to say its app tracking matches the “characteristics of Apple’s rumored tablet device” even though the analytics don’t provide any data about the characteristics of the prototypes. Flurry concludes the devices being tested are tablets because games, entertainment and book apps are being launched the most, according to analytics tracking, corroborating rumor reports that the tablet will have a strong focus on gaming and e-reading. But those are the types of apps you would expect to be tested the most on any iPhone-related prototype device to gauge performance and display quality. And there are more games in the App Store than any other kind of app. Moreover, Flurry’s data set — 200 apps — is extremely scarce relative to the App Store’s 100,000 offerings. Flurry’s blog post then quickly gets lost in rumor territory, reporting claims on screen size and other unsubstantiated nuggets, even though its analytics do not retrieve any data about screen size or resolution. Flurry tracks mobile applications and offers its customers usage stats and other handy numbers. It also knows what applications are being downloaded, to what device and where. It works like Google analytics: developers add Flurry to their applications and then their usage can be tracked, including geographic location, time spent online and even which mobile carrier they are on. This data is then aggregated so the developer sees just how their software is used. So Flurry’s analysis is such: Prototype devices aren’t leaving Apple’s campus, and they’re running iPhone OS 3.2. 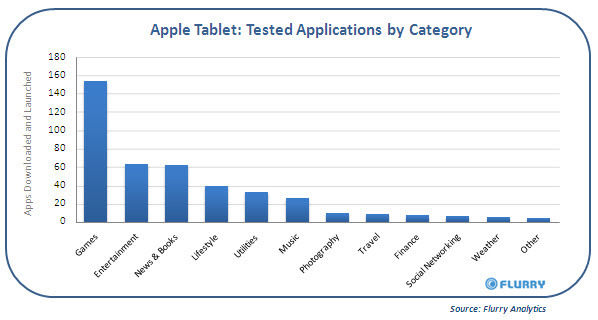 Out of a sample of 200 apps, they’re launching games, entertainment and e-reader apps the most. Therefore, they are tablets. To believe that conclusion, you’d have to take a few logical leaps of faith. First, you’d have to assume the tablet is running the same OS as the iPhone, and that’s unlikely. Or you could assume the tablet launches the iPhone OS in the background of its own OS, which is why it’d register as iPhone OS. (Good-bye, battery life.) Then you’d have to believe the 200 apps being tested are a strong representative sample of the App Store’s 100,000 wares. If we were to make an assessment, these sound more like fourth-generation iPhones in testing. But there is no solid assessment to make, based on such a small sample of data that offers zero insight into the device’s hardware. The figures just raise more questions. Do we assume that the tablet can run existing iPhone apps? Or are there, as we have heard, already larger, tweaked versions of current apps already in existence? In just a couple of days, we’ll know for sure. One thing that can be predicted with almost 100 percent certainty: Whatever Apple shows us, we will all suddenly have to go buy one. Updated 8:20 a.m. PDT: Wired’s Brian X. Chen contributed his skepticism about the report after contacting Flurry.